This is the most popular madbarz routine on their app. You can get it here for iOS and Android. You just can’t stop your muscles from growing with this routine. That’s why people around the world are doing it and you should, too. 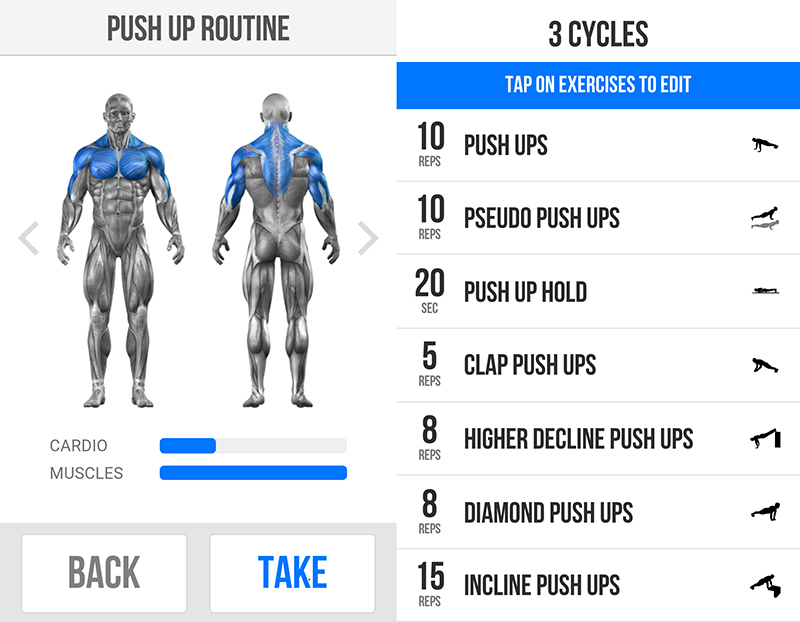 The secrets are revealed behind the most used Madbarz workout – The Push Up Routine. This killer combo of exercises improves each targeted muscle in all of it’s modes. Before we start, if you need reasons why push ups are awesome and tips how to do them, you can find them here. Following the routine makes you switch between different types of movements and positions resulting in a real shock effect for your muscles. Additionally, this intense combo makes sure that you push through strength plateaus much easier than if you were focusing on only one type of strength exercise. The included Clap Push Up exercise is an explosive movement. This type of exercise forces the body to change the existing ratio of different types of muscle fibres. Also, it increases the efficiency of the muscle fibers responsible for quick muscle contractions. That way, it teaches your body to apply strength quickly. This type of exercises is used to improve movements in many specific sports trainings, such as punching or throwing. The Push Up Hold exercise is done by keeping muscles under tension without movement. The tension includes both the muscles contracting and the ones opposing the action. The harder the hold gets, the more you feel tension distributing across different parts of your body. Some shut off, others get activated. Aiming to keep maximum tension and control means you’re pushing the limits of your whole body. This type of exercise activates nearly all available motor units, and that’s not an easy task. Takeaway: Get down to the floor and push.